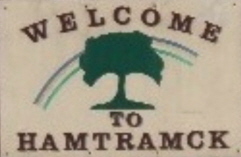 I’ve written a great deal about Hamtramck, Michigan, the city wholly surrounded by Detroit that once was home to Polish immigrants’ homes and businesses (including my great-great-uncle Chaim’s shoe shop), but which is now over-run by Islamofascism, as growing populations of (mostly illegal) Muslims from Yemen, Bangladesh and Eastern Europe move in. 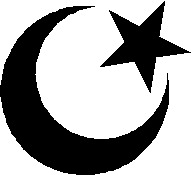 As I’ve noted, Hamtramckstan features the Islamic call to prayer from early in the morning to late at night, and Muslims have had the sheep which they planned to slaughter wandering all over the city. 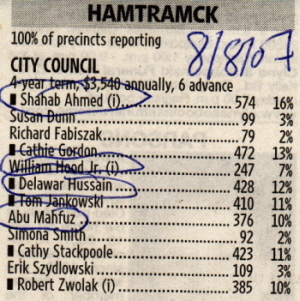 Still the Detroit area press have cited Hamtramck and its Muslim elected officials–who, thankfully, failed to take the majority in last year’s elections–as a model of Islamic integration into American democracy, and they frequently cite and quote Muslim councilman Shahab Ahmed. 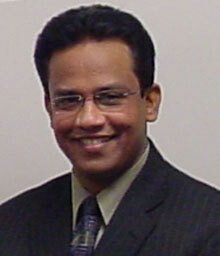 Hamtramck City Council Member Shahab Ahmed was arrested on Saturday, facing charges of spousal abuse. Neighbors said they saw two police cars pull up in front of his home Saturday afternoon. Hamtramck police would not comment on the case until after an arraignment. Neighbors said the councilman often plays with his children and goes for bike rides in his neighborhood. They were shocked to hear of his arrest. So what? Jeffrey Dahmer’s neighbors were shocked, too. I’m not shocked at all. Abuse of women and daughters, as we know, is a frequent feature of Islamic families. It’s allowed behavior. Ahmed, originally from Bangladesh was the first Muslim elected to the Hamtramck City Council, and received the most votes of any candidate in last year’s Hamtramckstan elections. Yup, Shahab Ahmed is the model Islamic City Councilman in America, indeed. I guess we should be thankful there wasn’t another honor killing. He probably thought he was living under Sharia law. Under Sharia law what he did is considered “legitimate”. Where are the nags from NOW? If I wasn’t Jewish I would think most Jewish men beat their wives. Most Orthodox Rabbi’s think wife beating it is a big problem. This is what this so called ORTHODOX RABBI ABRAHAM TWERSKI, MD WHICH THE ORTHODOX UNION POSTED ON THEIR WEBSITE. He claims that men know where to hit their wives where they are covered which means in english there is no evidence but Tweski believes Jewish men are so horrible and devious that they know how to hit them where they are no evidence and it is A GRAVE PROBLEM TO TWESKI. And to him fathers are an excuse. Here is the link. Furthermore, you have blog like Unorthodox JEw that claim that many ORthodox Rabbi’s are having affairs with women. THen you have sights like the awareness center that has a whole list of Orthodox Rabbi’s that abuse women. So if I wasn’t Jewish (and I know it is all propoganda but a bystander would not) I would think most Jewish men abuse their wives. How come Saudi Arabian women outlive men by 5 years if all men do is beat up their wives all day. I’m sure some don’t treat women well but again just for their own self interest. I once worked with a Muslim women who bragged rasing a kid without a father. So I’m sure the women are no prizes either. Qu’ran 4:34: “Men have authority over women because Allah has made the one superior to the other, and because they spend their wealth to maintain them. Good women are obedient…. As for those from whom you fear disobedience, admonish them, forsake them in beds apart, and beat them.” This is the primary basis for the legitimacy of wife beating under Shari’a law, which, to believing Muslims, is the only legitimate law. The Qur’anic passage I am quoting is from the Dawood translation, widely available, published in paperback by Penguin Classics. Beware bowdlerized English translations of the Qu’ran, which omit this passage altogether or suggest that the husband administer “light” beatings to the wife if she is disobedient, an interpolation not justified by the urtext, according to the vast majority of Muslim clerics and jurists. Wife beating and spousal abuse is sanctioned by Islam, and by Islamic law. It should, therefore, surprise no one that the incidence of this behavior among Muslims is disproportionately high; many other instances of such behavior committed by Muslims here and elsewhere in the West are probably never reported to the authorities. As a good Muslim he would have known to beat her ‘lightly’ with something that doesn’t leave marks, like the Islamic toothbrush. There are many Sowdi experts on wifebeating on youtube, recorded from ME-TV stations, where the uninitiated can get their instructions on how to beat wives in all the right places and how.